Since it seems like it’s been snowing a lot this year, I’ve been mentally preparing myself for the best way to pick up Olivia from school on rainy or snow days; as well as for days I have no sitter and I have to bring all the kids to pick up big sister with me. Today was just one of those horrible days that no parents wish to bring their kid to or from school. The rain stared out light this morning and we weren’t sure what to expect on the way home based on the forecast because it’s usually a hit or miss. Well, the snow was really coming down and it was wet, more like slush than soft delicate snow. It was a little windy and the snow was falling sideways at times. 1- If I give her the umbrella, it will eventually blow away because she isn’t strong or experienced enough to hold it against the wind to avoid the snow blowing into her face. 2-I’m thinking it would be difficult for me to hold the umbrella for us both because of our huge height different and there’s no way for me to hold hers and mine. 3- I’m thinking I wouldn’t be able to look forward (not Olivia), if we just plop the hood attached to our head over our heads even though the hood is large. 1-No umbrella for either of us. 2-Water resistant caps, instead of the winter wooly hat to prevent the snow from falling into our face. 3- Snow boots, waterproof coat and water resistant pants for us both are a must in this situation. I am happy to say we succeeded in getting home without getting soaked or uncomfortable. No complaints from the little one about being cold or getting wet! Olivia had on her mittens and fleece gator for her neck warm and to keep the snow out of her nose and most of her face. Only her eyes were really showing. The only difference for next time would be perhaps to tie back both our hair because it was a little exposed and the snow got on it. The water resistant cap did an amazing job keeping the snow out of our faces. 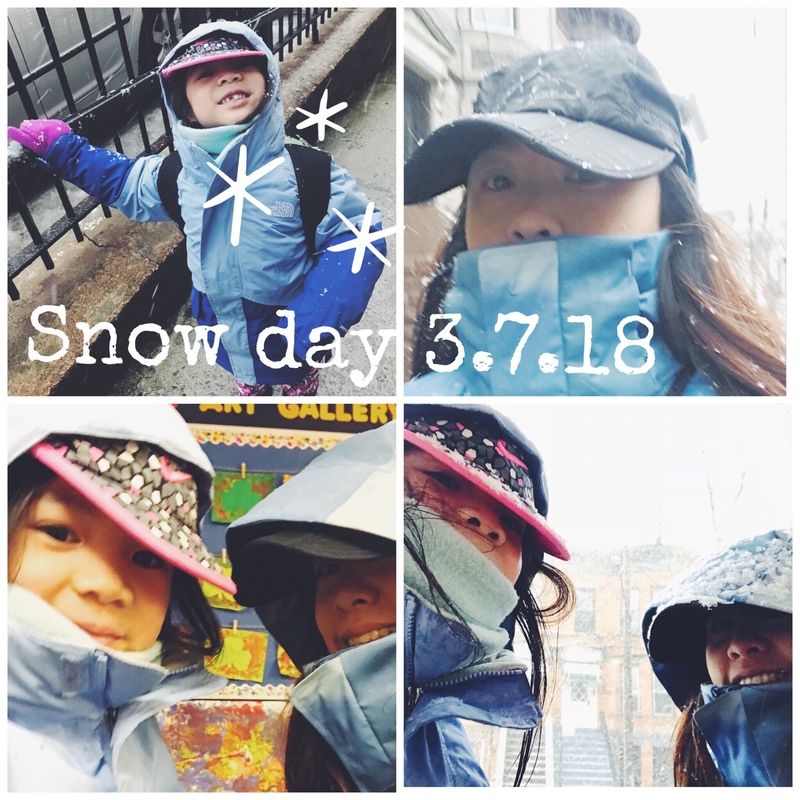 How do you prepare for bringing the little ones to and from school during s now days?